Hundreds of homes and shops were demolished yesterday by the Ogun State government in a road expansion project along the Ojodu-Alagbole-Akute-Ifo road. The buildings which had been marked for demolition last year, gave way to the blows of the caterpillars which pulled them down. The demolition, which began around 9am, affected structures on both sides of the Ojodu/Alagbole road at Yakoyo and the Sango/Ijoko road all the way down to Ogba-Ayo. Shops, residential buildings and shanties were lost to the demolition which was carried out to clear structures within 22.7 metres from the road. It was said to have lasted well over six hours. At Ogba-Ayo along Ijoko road, a shopping complex housing over 70 shops, two petrol stations and scores of residential buildings were destroyed. 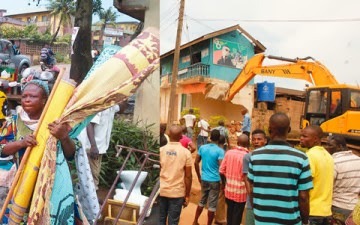 As of 4pm, Sango residents, whose buildings had also been marked for demolition, were seen hurriedly moving their valuables in preparation for the demolition that would continue on Tuesday (today). Some landlords who were aggreived by yesterday’s demolision alleged that the Governor Ibikunle Amosun administration did not compensate them or map out a resettlement plan for the people affected by the demolition. The owner of a two-storey building at Yakoyo, Mr. Nuhu Aruwa, said he built his house with the money he had saved from 35 years service as an officer of the Nigeria Customs Service. He said, “I have been living here for the past 26 years. I am a retiree and I manage a paint manufacturing company here. Early last year, the Bureau of Land and Survey came and marked our houses, saying it wanted to expand the road and that people should file their claims for compensation. “We told them to let us know how they intend to compensate us. At least, my present house is worth N50m. “Later in September this year, the ministry officials said we should await letters of acquisition and after we agreed on the value of our houses, we could move out. Aruwa, who hails from Kogi State, said he was awaiting the letter when he was told that his house would be demolished on Monday morning. Another landlord, Mr. Moshood Yusuf, said he built his house in 1986 and caters for his15 member family with the money he makes from rents. He said the state governor disappointed residents when he visited the area a day to the demolition, without interacting with the landlords to know how they felt. It was learnt that many of the landlords were confused because their buildings had been marked three different times. A source said the state government had said initially, that it would only clear structures within 5.2 metres distance from the road. This was later increased to 13 metres and then 22.7 metres. Many residents were caught unawares by the demolition and appealed for time to evacuate their property. Others protested the demolition and were seen making frantic calls to officials of the state government. Those who observed the demolition told reporters that some residents were not at home when the caterpillar began pulling down some structures. Around 9.30am, an officer from the Bureau of Lands addressed a group of landlords. As the demolition continued, some of the residents wept. The Permanent Secretary of the Ministry of Works and Infrastructure, Kayode Ademolake, told a correspondent on the telephone that the residents were opposed to change in the state. He said, “They were served two years ago and even in the last three months, we still reminded them. But you know that even if you give some people 1,000 years, they will still continue to be there. When development is about to take place, there will be resistance, so we are not surprised. “No responsible government will however continue to watch a road that has been degraded for over 30 years without doing something about it.